LD Prismex has been redesigned, and is now a 24V LED system. This has allowed a smaller LED profile to be designed, and reduces the quantity of LED drivers needed. It is an ideal product for back bar/shelving lighting, light boxes with restricted depth and back lighting to signage/posters. 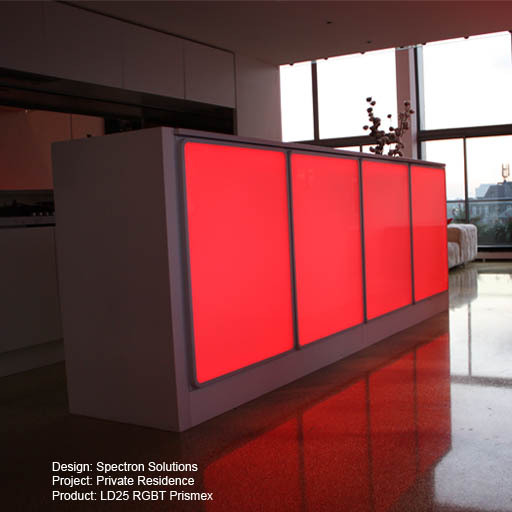 Prismex panels are made from clear perspex which has a custom white dot matrix screen printed onto both sides. The sizes of the dots vary in size depending on how far they are from the light source. The further away they are the larger the dots, and the more light these reflect. When used with a frosted panel this creates an even glow. A range of output options are available including RGB. The product is custom made to suit dimensions on site.